Who will win? Watch to find out! It's a rivalry almost as old as time itself - well ok maybe not, but the Android versus iOS debate is one which causes temperatures to rise and profanity to spout from the mouths of even the most innocent of five year olds. 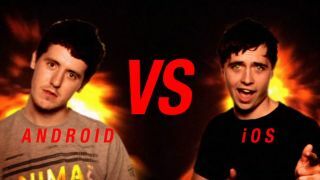 We've booted up the TechRadar Street Fighter engine (patent pending) to see who comes out on top when we pit Google's Android against Apple's iOS. Everyone has their favourite, who will you be rooting for in this clash of the titans? Can the open source, customisable and general OS around town Android take the crown, or will the streamlined, content rich and rather exclusive iOS steal the show? Watch the video below to find out. Has that got your blood boiling for some more instant action? Then check out more QuickRadar videos. Console vs PC gaming - which is better?